There was a lot of selling over the past week, yet the PMO Index didn't move lower which strikes me as bullish short-term. So, I would say the short-term uptrend is probably intact although I don't really know. The short-term trend is difficult to determine during these periods of market stress. Also, the days leading into Thanksgiving are seasonally favorable for stock prices, so that may be having an impact. When in doubt about the market, consult the new highs/new lows. 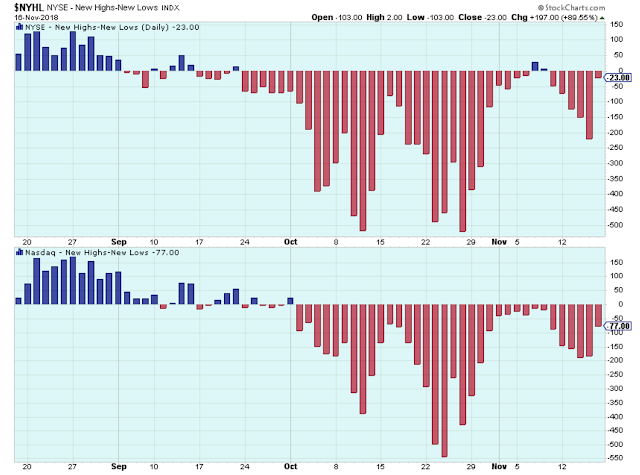 This chart shows they are still net negative, although there is considerable improvement from October. This chart shows that stocks are still under selling pressure, and this selling pressure is happening while the PMO index is near the top of the range. That isn't a good combination. I think the market was helped a bit by the comments from the Fed in which they acknowledged the global economic slowdown, and this implies less upward pressure on rates. The positive reaction from the market seems to say that bad news for the economy is good news for stocks. We've now had years of this type of stock market so it shouldn't be too surprising, yet there I was being surprised. Technology stocks have been this bull market's leaders, and lower rates help high PE stocks such as Technology. So if Technology rallies on news of lower rates, then even with a diminished but muddling economy, the stock market can start to move higher again. It's hard for me to wrap my head around this, but that's the way it is. Something to keep in mind. 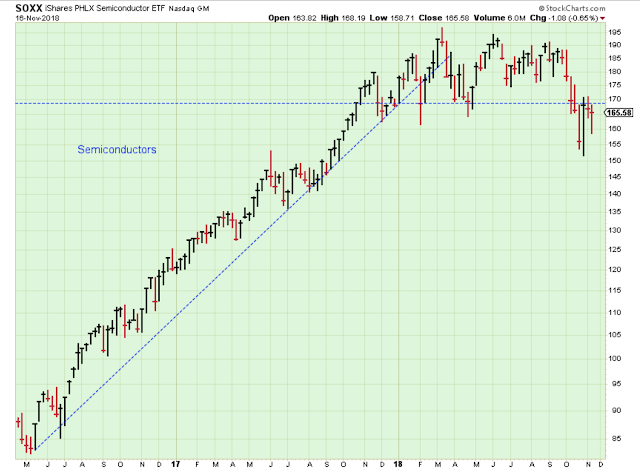 At the moment, the market-leading semiconductor index is below support. This looks like an important line in the sand. Below this level, and the general market probably struggles. Above this level, and there is a chance that the market can pull together and move higher. This is the chart that brought about the recent recognition of global weakness. Oil prices really control a lot. When oil prices are weak, rates can stay low, etc. So, weak oil prices are good news for stock prices if the world economies can continue to move higher... even if the economic growth is weak and choppy. It is in everyone's interest for oil prices to remain healthy. So I would not be at all surprised to see oil start to reverse higher soon and perhaps bounce up towards its resistance level.